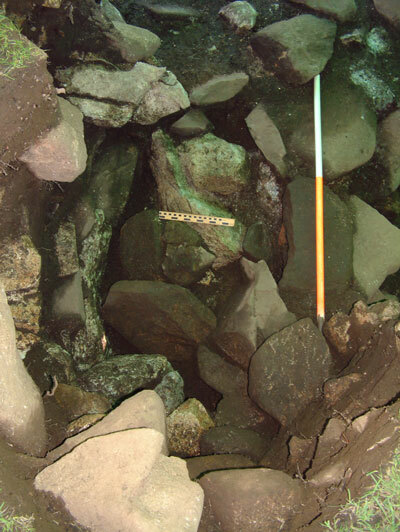 A burial dating back to the Iron Age has been uncovered during excavations to uncover the original entrance into High Pasture Cave. During the removal of the baulk that has been left standing between Trenches 2 and 3, Martin Wildgoose uncovered small fragments of bone including part of a mandible containing two teeth. This was at first tentatively identified as human, due to the presence of other less diagnostic pieces of bone in the same sector of the trench. Soon afterwards he recovered a small object manufactured from antler, a possible ring-headed pin. The image above shows the pin, a quite slender item with a slightly polished end(to the right in the image). The small hole piercing the ring-head has been bored through the bone and bevelled slightly at each side (scale=5cm). This may be some form of dress or hair fastener, although we cannot rule out other uses for this object. After a little more careful work, excavating down below where the pin was recovered, Martin started to uncover more bone including fragments of skull and lower mandible. Unfortunately, the human remains appeared to be extending under the trench section, so a decision was made to extend the trench in the area above the skeletal material. However, before disturbing the human remains further we contacted the relevant authorities including the local Police, so that the necessary procedures could be put in place. At this stage we could not be certain if this was a formal burial or the descarded fragments of a skeleton. However, as will be obvious from the image shown below, a large pointed rock had at some stage pierced the skull causing considerable damage. After permission had been granted by the Police and Procurator Fiscal to continue with the excavation, we extended the trench above the human remains and removed the overburden. With the remains located around 1.25m below the present ground surface, this involved a considerable amount of stone and soil. However, we did recover a fine pebble hammer/grinder manufactured from a granite beach pebble. After two hard days of work we reached a level immediately above the human remains and started to excavate the deposits with more care. As we carefully excavated between the boulders within the setting we started to uncover more bone and it became increasingly obvious that the human remains were covered by the same chaotic fill of material. Using small plastic spatulas and brushes we uncovered more of the grave setting. The sediment from the burial was 100% wet-sieved to retrieve very small fragments of bone, possible grave goods and ecofacts. Several small, abraded sherds of prehistoric pottery were recovered, one small rim sherd having possible decoration. 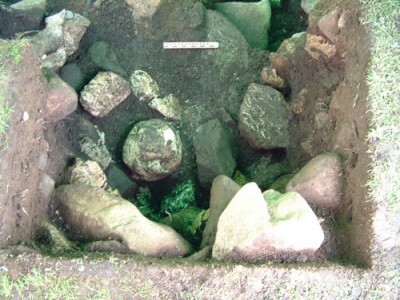 Fragments of charcoal, hazelnut shell and fire-cracked stone were also found, indicating that the fill of the grave was similar to the associated context adjacent to the burial. During this stage of the excavation we removed several large stones that were found to be resting on the chest and abdominal areas of the skeleton. Had these stones been deposited in this manner to pin the body down in the grave setting? In the image shown above, it can be seen that the skull, pelvis and major limb bones are relatively well preserved, while the rib cage has been completely destroyed by the large stones removed from above. Small fragments of rib can be seen lying on top of the pale limestone block and other stones started to show in the burial has sediment was removed. Unfortunately, out trench extension has failed to reveal the lower limbs and feet, and a further extension will be undertaken during the next week of work on site. Over a period of three days we continued the detailed recording and excavation of the burial. Removing bone as we progressed, the human remains were found to be resting on an uneven chaotic fill of stones in the base of the grave. As we excavated the pockets of sediment that had filled the hollows between these stones we recovered further bone fragments, some of these up to 15cm below the main level of the skeleton. It therefore seems probable that the body was surrounded by air-filled voids as decomposition took place, small bones percolating down into these areas before sediment started to fill these hollows. We can now be fairly certain that the body was placed in the grave setting while fleshed. The ball joint on one femur was found to be still articulated in the socket of the pelvis, while the second joint had only been displaced by a few centimetres. The body, most likely that of a young woman, was interred on its back with arms by the side. However, is it possible that the grave was left open for some time afterwards? It is presently difficult to explain the massive trauma in the area around the chest cavity and it is possible that the large pointed rock that had penetrated and fragmented the skull was a deliberate act, carried out some time after the body had been laid out in the grave. Further analysis of the human remains and excavation of the grave setting and its immediate surroundings, will hopefully answer these questions. 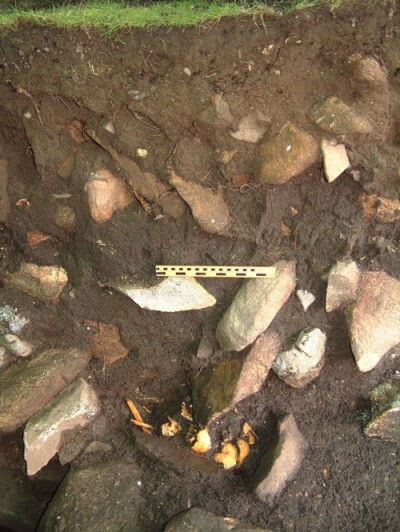 The location of the burial is interesting, placed as it is at a boundary between the structured lenses of material filling Trench 2 and the chaotic fill of Trench 3. 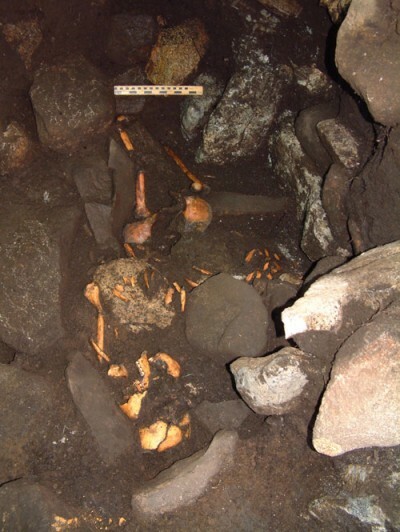 The burial has also been located immediately above the former entrance into the cave. Around 0.5 metres below the burial, in the deeper trenches to either side, we have uncovered what appears to be structural elements within these quite different deposits. These structures may be associated with the formalising of the entrance into the cave - corbelling forming a man-made passage into the cave. Therefore, the next few days excavation at the High Pastures site should be most informative. The discovery of the Iron Age burial at the High Pasture’s site is a rare and important find. 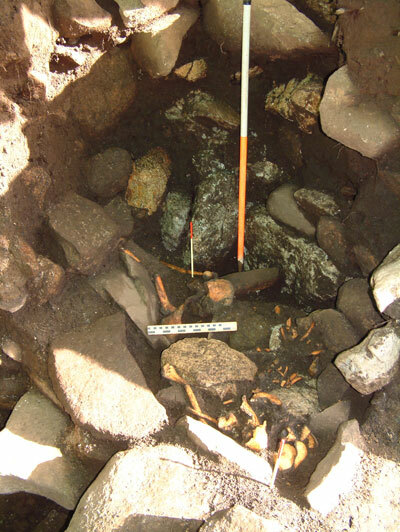 There are few complete human inhumations from this period, which is unusual considering the wide range of settlement remains that have been identified in Skye and the surrounding prehistoric landscapes. Archaeologists’s have found it difficult to explain the absence of burials from the Iron Age, current thought suggesting that the bodies of most people were disposed of in ways that left no tangeable trace. It is possible that many bodies were exposed to the elements and scavengers, were deposited in rivers and the sea, or were cremated after which the ashes were scattered on the land. 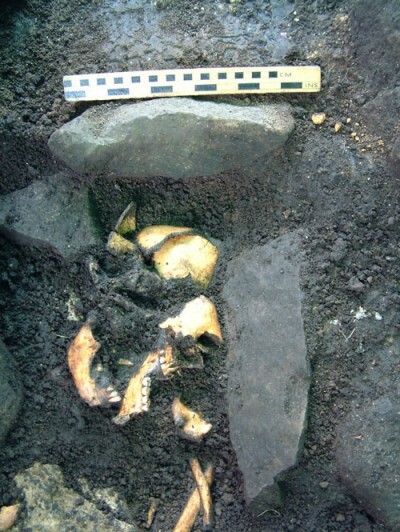 Whatever the case may be, the skeletal material recovered at the High Pasture Cave site will provide a unique opportunity to study a wide range of aspects of Iron Age life and death in the region. It is not yet known whether the bones are well enough preserved for DNA analysis, but isotope analysis will hopefully provide information about the persons diet, and whether the individual was a local or came from outside the island. 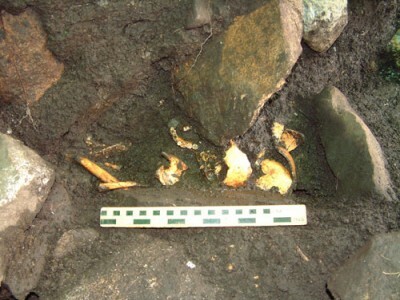 Modern forensic archaeological techniques could also provide a wealth of information regarding age and cause of death and the individuals medical history. The discovery of the human remains at the High Pasture’s site also parallels finds made at the spectacular Iron Age site of Mine Howe in Orkney. Two human inhumations have been uncovered so far at Mine Howe, one of these interred below the floor of a smithy at the site. It has been suggested that metalworking processes, ritual and death, were closely associated during the Iron Age. And, since conventional burial seems to have been exceptional during this period, it may be possible that inhumations as uncovered at Mine Howe and the High Pasture Cave site were of special importance or contained individuals that were in some way marked out for special treatment. The religious beliefs and practices of these Iron Age communities were undoubtedly rich and complex, and we are still some way from achieving any real understanding of them. I am gobsmacked; the report of recent human find, as Ivan mentioned, is amazing and just opens up loads of questions! Well done! Hope the rains aren’t hindering you too much. See you soon! Exciting news of the iron age burial. Who knows what else you might find. Keep up the good work. Wow! Well overdue return to website & what a difference. You’ve come on leaps & bounds. Virtual tour is great. Feel I’ve been down now. Latest find of burial really exciting. Brought up to date by Martin last night so had to see for myself what is happening.